Here be Dragons has particular expertise in a number of periods of English history, notably the Tudors, Regency and Victorian. In the latter of these periods we can offer a notable, and rather unusual, entertainment the �Magic Lantern Show�. When Ellis joined the actors company of the newly opened Museum of the Moving Image in 1989, he developed a special area of interest, the Victorian �Magic Lantern Shows�. 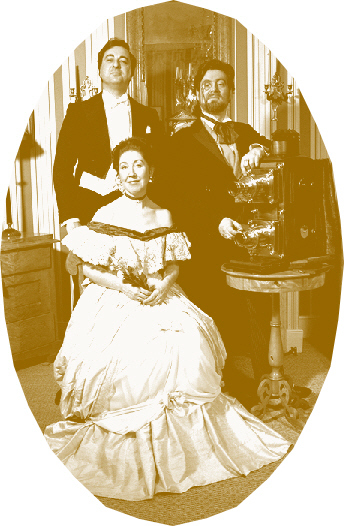 His specially written �Magic Lantern Spectacular� and �Just a Song at Twilight� feature Lantern Showmen portrayed by Ellis and fellow performers, using genuine equipment well over a hundred years old, to recreate the spectacle of the Victorian Lantern Shows. These can be enhanced using other Victorian Entertainers including singers, musicians, and even a Male Voice Choir, all provided through Here be Dragons. These authentic entertainments have been seen at the Players� Theatre, the British Museum, Brighton Royal Pavilion, Preston Manor, the Public Record Office, the �Moonshadow Festival�, Sevenoaks Stag theatre and heritage venues about the country. As an accomplished Lantern Showman, Ellis performed in the �Cinema 100� celebrations, notably at the launch before the Prince of Wales. 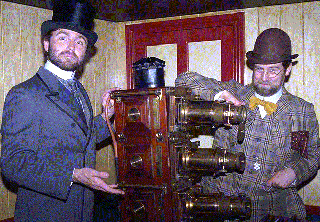 Ellis is often called on by film and TV production companies to advise on the use of the Magic Lantern.